On 9th/10th November 1938, Nazi stormtroopers led a wave of violent attacks on Jewish people and property throughout Germany and Austria, which the Nazis had annexed. During these pogroms, 91 Jews were killed, thousands were taken from their homes and incarcerated in concentration camps, 267 synagogues were destroyed, and some 7,500 Jewish-owned shops were smashed and looted. 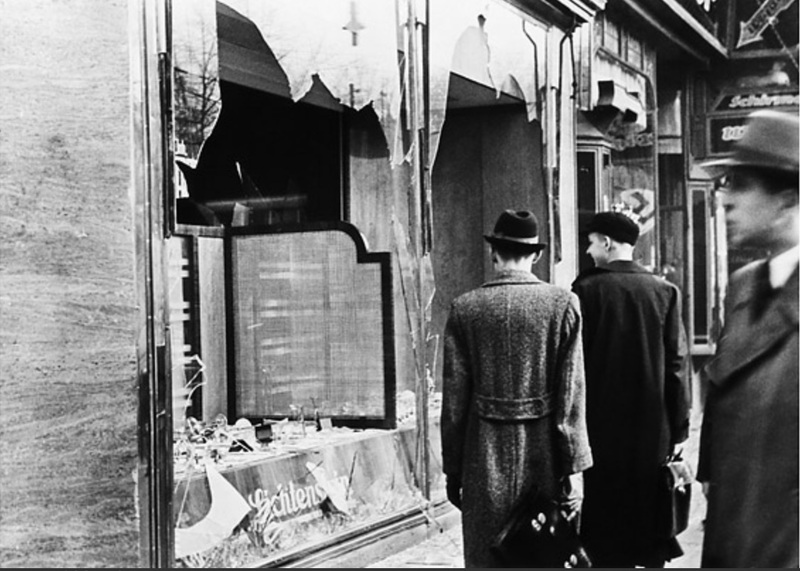 The Kristallnacht pogroms presaged attempts to remove Jews from German life completely. Many Jews left hurriedly to seek refuge in friendly countries, including Britain, but Britain was already in the grip of an “aliens scare”. Newspaper headlines declared: “Alien Jews Pouring In”, and claimed that “Refugees Get Jobs, Britons Get Dole”. The media accused Jewish asylum seekers of “over-running the country”. Despite wide public revulsion at the violence of Kristallnacht, powerful elements in British politics and business continued to admire Hitler and the Nazi regime. 80 years after Kristallnacht, the Alternative für Deutschland (AfD), who combine right-wing populism spiced with antisemitism, alongside virulent Islamophobia and anti-refugee sentiments, are winning a rising number of German voters, while Austria’s Freedom Party, which has close relations with AfD,and was founded in the 1950s by a former SS officer, is now a junior partner in Austria’s coalition government. Their ideas are shared even more openly by nationalist governments in Hungary, Poland, Ukraine and the Czech Republic, where Muslim, Roma, Jewish, and refugees communities are fearful. Here in Britain, people were shocked to hear of the massacre in the Tree of Life Synagogue in Pittsburgh but Donald Trump has massively boosted the confidence of the most dangerous white supremacist forces. The warnings were already there in Charlottesville when hundreds of neo-Nazis marched chanting “Jews will not replace us”. In Britain, a more diffuse racist movement has gathered, which includes antisemites, and has Tommy Robinson as its figurehead. In June and July it turned out huge numbers on the street, with Robinson’s wealthy American and European backers providing the infrastructure for its rallies. We urgently need to unite all anti-racist and anti-fascist forces with minority communities to stop the far-right in their tracks when they take to the streets, but we simultaneously need to develop a more sophisticated operation to challenge the toxic ideas they are spreading and sharing online, that are echoed in the tabloid press, and prevent them becoming the new “common sense” in our local communities. There is a battle of ideas and at the moment, internationally, we are losing. 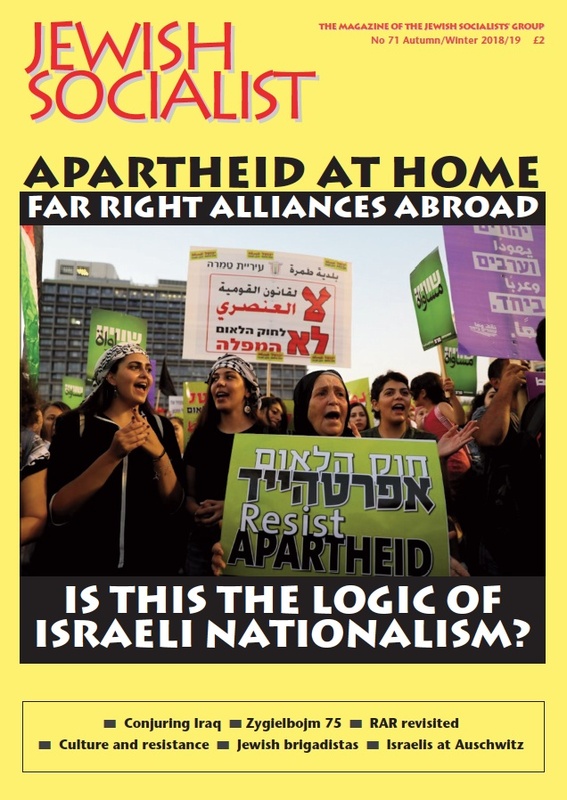 The left has always played a key part in opposing racism and fascism, yet it is extremely worrying to see the political gulf widening between the left and those who see themselves as leaders of the Jewish community, but focus mostly on defending Israel’s reputation. There is a big responsibility on the shoulders of progressive Jewish movements to convince the wider Jewish community to focus on our diaspora priorities – to stand shoulder to shoulder with migrants, refugees, trade unions and left movements to defend all communities who are under attack. We can take a step in that direction by ensuring there is a large and powerful Jewish bloc on the Unity Against Racism and Fascism National Demonstration on Saturday 17th November. Come and join us!